is when this monstrosity is listed as heritage. Now I’m all for preserving historic buildings and not being too rash with planning but there is nothing heritage or worth preserving about this. Anyone who has seen it or, worse, stayed in it, knows that. So I’m glad to see that the University managed to purchase it and now will demolish it. Yet amazingly, The Age can still find someone to come out and say that it was ”another part of the steady attrition of significant buildings in the city”. Most of the architecture from 1950-1970 should be (sparingly) preserved as cautionary example of how architects can utterly vandalise public spaces. Is there a worse architectural period in history? Mind you, Jim McClusky’s argument that a medical institute on this site will give more value to the public than the heritage value does is really silly. It is not a matter of having to choose one or the other. The medical institute could be put elsewhere. Of course the heritage system is “broken”. From the outset, when the gov’t can designate something heritage and thus lock it up by legal fiat forever from alternatives or improvements, without contributing a red cent to it, or buying it if it’s that important. In other circumstances it’s called theft. Small wonder that there’s angst about it, and the owners that can afford to wait it out let those properties fall down. ‘Heritage’ has its place, but if something is that important it should be purchased, or maintained courtesy of the gov’t – eg, by tax deduction for maintenance costs. Making a financial contribution a requirement would soon sort the good stuff from the ‘also rans’. 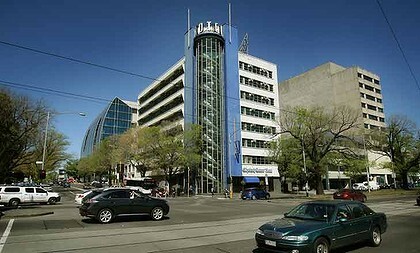 I agree with Davidk but having said that, I actually quite like this building and it would seem a pity to demolish it. I just love the circular staircase in the corner of the building. Check out the new Alan Gilbert building in the picutre to the left of the building to be domolished – an example of modern architecture – Yuk and completely impractical (hot in summer, freezing in winter, great swathes of space wasted). It’s hardly worth pointing out, but your expressions of taste as economists are pretty irrelevant and certainly no more important than anyone else. All kinds of significant buildings have been demolished or neglected before history has recognised there significance. Selecting buildings for heritage should have some component of historical study by specialists and not be left purely up to just contemporary preferences. The government should be sensitive and selective about what restrictions it places on development, but the idea that the “owner” of property should be free to do whatever they like without regard to the rest of the community is bordering on infantile.